Another Blessed day in the lives of a very special family. I see a glimpse of your chairs, they look so pretty! The leaf candle is lovely too and looks like fall. Oops! Hope the leak won't be too hard to have fixed!! Girls are adorable, dressed for rain and cooler weather, refreshing to see when FL is still so hot. Rain rain rain! All over first day! So sad about the leak. I hope it was an easy fix! Happy First Day of the Month (a day late). Can't believe it's October already. Hopefully you got to cuddle those little cuties on that rainy day. Those are some pretty cute rain boots! Hope you were able to fix the roof - yikes! An empty coffee cup is a sad sight. lol Your kiddos are so cute! Popping over from Niciole's link up! 8-( Empty coffee cup. Not so sad if you enjoyed it to the last drop, i guess! 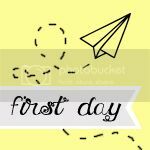 Another precious chronicling of a first day!